Gary and Peggy DeForeest, 4-H Family of the Year. The 4-H Family of the Year Award recognizes a family’s support for local 4-H members and programs. 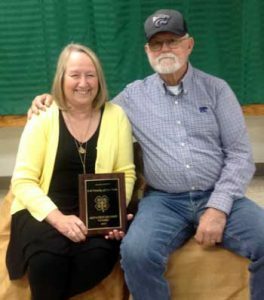 Presented the award last 4-H year, Gary and Peggy DeForeest, of rural Scranton, were recognized for the love and guidance they have given to Osage County 4-H over the years. Peggy began her employment with the Extension office in July 1986. She fell in love with the 4-H program and Extension that summer and continued to work here for 30 years. Everyone knows they would be greeted with a warm smile when they walk through the door at the Extension office. But, Peggy also handled many things for the 4-H program, such as typing the fair book every year, putting 4-Hers’ information into the computer year after year, newsletters for 4-H clubs. She was recognized as the glue that holds the Extension office and 4-H program together. Peggy retired from her job at the Extension District this summer. Gary was recognized for his support for Peggy and the 4-H program in his own way. Gary is a gifted carpenter, and judges projects at local county fairs around the state. For the last three years he has been a woodworking project leader for the Lyndon Leaders 4-H Club. The woodworking project has grown in number of participants every year, and when other youth in the county have asked for help with woodworking, Gary has always been happy to help. The 4-H Family of the Year Award recognizes the DeForeest family for their care of the community and the families that live here.